We know that many of you will have raised sponsorship money for one of our Affiliate Charities. Please visit your charity in our Charity Village to give them the opportunity to say a big thank you! The dedicated Charity Village in Lower Gardens is where runners and spectators can meet with their chosen charity before and after their race. Charity staff and volunteers will be on hand to support and congratulate you on your achievement, and to thank you for any funds you have raised. They may also offer you some snacks or a cup of tea, or perhaps a massage to ease the pain of any stiff legs! Please feel to pop along and say hi, they’d love to chat! The Charity Village is open from 8am til 8pm on Saturday 6th, and from 8am until 5pm on Sunday 7th October. In the charity village, you will find our Official Charity, Macmillan Cancer Support, as well as our Premier Affiliate Charities: Julia’s House, Save the Children, Cancer Research UK and Parkinson’s UK. Please contact your charity directly for further information including their timings for the day to enable you to plan accordingly. Affiliate Charities are invited to meet runners at the Charities A-Z Meeting Area (note that this is not the same as the runners reunion area). This area will be marked by orange “charities” flags splitting the alphabet from A-Z. 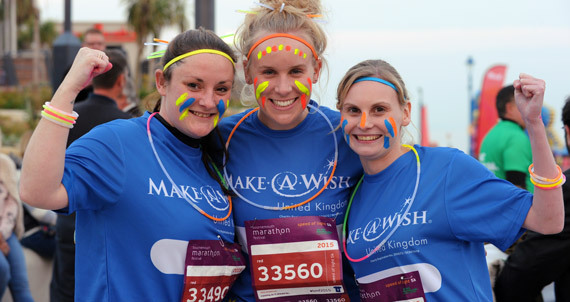 Please contact your charity directy to find out if they will be there on the day of your race. Contact details can be found here.